British PM Theresa May and Trump met in the Oval Office to discuss U.S.-U.K. relations before giving a joint press conference at 1p.m. this afternoon. 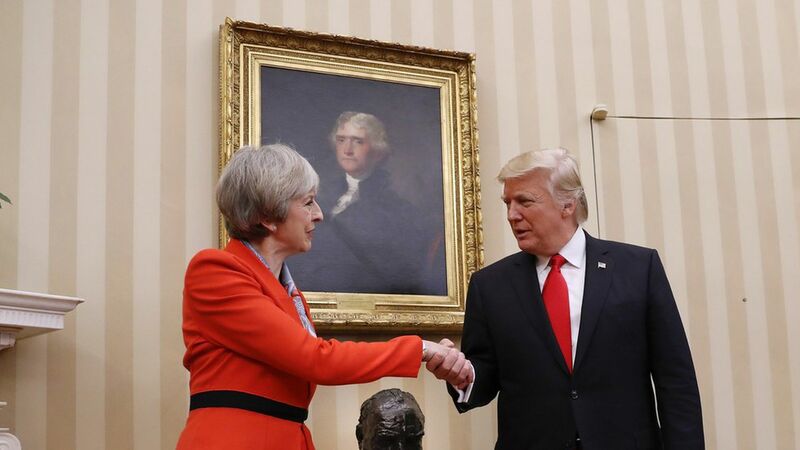 Trump showed May the new bust of Winston Churchill, and said "it's a great honor" to have the famous leader back, according to White House pool reporters. Trump made a point to get the perfect picture with the bust, asking to move a lamp that obscured the shot. "It's a great honor to be here," May replied. May started her day in Washington with a wreath-laying ceremony at the Tomb of the Unknown Soldier at Arlington National Ceremony before making her way to the White House. The PM gave the first lady a hamper treats from Chequers, and gave Trump an engraved Quaich — an Irish cup that serves as a symbol of friendship — before leaving tonight for Turkey.